Heavy rains lashing Kerala, and as estimated with 10-15 kmph North Winds. figures will be available on Sunday, but some places have received more than 100 mms. Chennai was dry today, and had S/SW winds in the day turning S/SE by evening. Mumbai had 1/2 passing showers, and Delhi NCR had localised showers in some parts . So, the Line of Wind Discontinuity has been created and formed as expected. More thunder showers inland (Southern Peninsula ) tomorrow. WD in the upper level is crossing North Pakistan, and another follows from the West. Things are moving and changing next week ! Mumbai: Partly cloudy and sunny. A few passing showers. Day temperatures around 31/32c. weekend rain amount will be just around 5 mms. Outer townships will be warm , with passing showers. But still will manage a daily rainfall between 10-15 mms. Pune and Surat: Partly cloudy, with a light drizzles in some parts. Around 3-5 mms rain possible. Day will be around 29c. Chennai: Saturday may see an isolated rain shower drifting in some area, but chances are less. Sunday will be dry and warm.Heat index may be around 38c. Rains intensity increasing from Wednesday. Delhi NCR: Warming up, partly cloudy, but chance of a shower in some parts. Scattered local shower possible. Sunday will be dry and warm. Kolkata: Rain intensity increases slightly from Monday. The SWM has started withdrawing from Western and Central Pakistan. The trough in the extreme North of Pakistan is "pushing" down , and the resultant WD is causing the seasonal low to weaken and elongate, that is concentrated regions are not seen. North Pakistan continues to get rains with Islamabad getting 30 mms today. 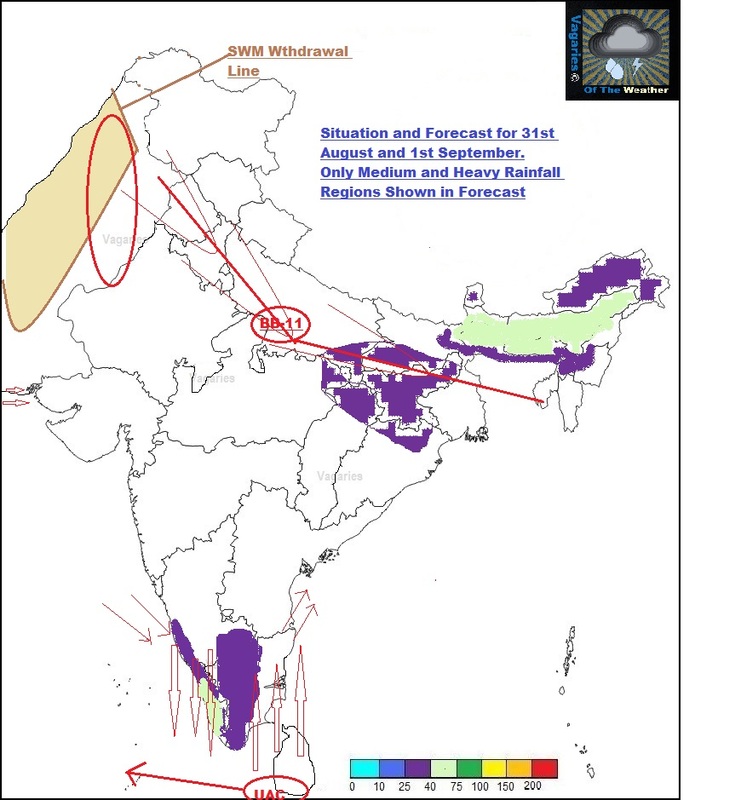 Possibly, complete Monsoon withdrawal parameters may develop by Tuesday over entire Pakistan. BB-11 is hovering in the UP region as a weak system. At the most, we can say it being embedded in the Monsoon Axis, is keeping active precipitation along the axis. Rainfall is persisting along the axis line in North MP and adjoining UP. As the system fizzles out by Saturday, rainfall will be shifted to the Eastern end of the axis. The western end of the monsoon axis is basically dry and has seen the SWM withdrawal commence. Coastal Sindh region may still see some very scattered light showers on Saturday...may dry up after Sunday. West winds prevail. Now, an UAC in the Southern Sri Lanka region is going to bring dry weather for Chennai in the next 2 days. Yes...dry weather. As the system moves Westwards and weakens in the Arabian Sea, we will see a rush of North winds into the system along the west coast, and a rush of south/south -west winds along the East (TN) coast. Hence, spent winds will bring dry and windy (South/South-West winds) conditions to Chennai and TN and moist winds will bring wet and North winds to Kerala. This also forms a weak perpendicular line of wind discontinuity in the Interior Southern Peninsula, South of 12N. Thunder showers may be expected along this line in the interiors of southern Karnataka and parts of Western TN. Kerala gets the double benefit of precipitation. Due to favourably placed Monsoon axis position, Nepal and Kathmandu are getting good rains. Kathmandu received 15 mms today (Friday), taking the August tally to 431 mms, against the monthly normal of 330 mms. Showers will continue this weekend also. Dang got 87 mms today. So, this is the beginning of the end. Here in Kathmandu, thundery heavy showers in the evening - as has been the norm this monsoon - no persistent drizzle like rain - rather more of heavy downpour now and then. Stats show more than our share of rain has fallen this monsoon season. Cannot call this a weak monsoon for sure , but rather it has been an erratic, temperamental monsoon. From Aug 23 till 26, i was at the southwestern town of Nepalgunj (reputed to be the hottest place in the whole country); and hot it was - dry hot weather till 25th, but 26th morning was different with very very heavy rain- around 100 mm in three hours or so. I would expect the monsoon like weather to continue for another 15 days or so with mornings increasingly getting cooler.Things would still remain a bit hot and humid for us till maybe the start of second week of october as is the norm. Absolutely dry weather in Chennai now..winds from NE because of the UAC near Lanka..storms that formed over west moved S/SW and dissipated. It is raining since morning here in malad.medium to heavy.. Moderate to Heavy rains in Vasai past 20 mins, looks like monsoon weather is back very gloomy too.sudden change. but nice cool weather . This is a very superb analysis. 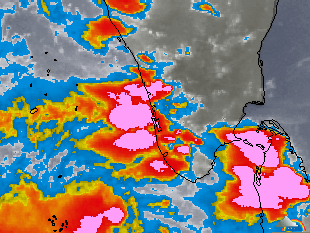 The UAC at southern tip of Srilanka no doubt will bring dry weather to NE portions of TN. Further drift of UAC into west will change the wind pattern and as pointed out by you only interior west of TN will get rain. Viravanalluran - what is your estimation of NEM? Normal/below normal? SE interior KAR still with very low rain (similar to last 4 years). BANG-350mm, MYS-160mm, MANDYA-80mm, rest places between 150-200mm (kolar,tumkur,even rayalseema)since june. SEPT is the only month left else worst drought. Do you think it will rain in interiors of KAR during SEPT? 2012 sept rain was 0mm for BANG. Here comes September-the month of early morning intense thunderstorms for Chennai and onset of easterlies!!! As the Sept month get starts, each year's scenario is back.. Today Badlapur experience first fog for the current season & visiblity was reduced to 400mts. Lowest August rain for city suburbs in 14 years..
Pune chilled as min temp 18.2°C today. In order to help the contestant, i have provided the 31st August Update. I request all to participate. Vagaries Certificates will be provided at the end of the result. I.City Rainfall Expected - 2 points for 25 mms range and 1 point for 50 mms range. II Heavy Rainfall (one from all regions)- 2 points for range of 100 mms and 1 point for range of 200 mms. Top 10 is given for helping purpose. Please see the updated top 50 and state wise toppers in pradeep's page in Vageries before quoting the Highest Rainfall for the season. At 3am in the morning Vasai had received very heavy rain for 10 mins.looks like monsoon is picking up momentum on the west coast once again. Good Analysis GSB sir. Which division according to you will top the next fortnight. TN has good chance to come in top according to vagaries forecast ? Very hot and humid today in Chennai..storms which formed over west moved away from the coast..W/SW winds are expected to be back bringing thunderstorms in couple of days..also easterlies may set in north bay bringing showers to AP coast in the middle of next week.